With figgy pudding and the Queen's address, one regular treat many British families will be enjoying this weekend is the cryptic crossword. What are they doing as they pore over the convoluted clues? The Christmas break allows British families time for play, which some may choose to spend around a board game; others turn to the fiesta of puzzles in their newspaper. The most traditional of these, and the one with the strongest British flavour - with its mixture of cricket and carols, pantomime and parliament - is the Christmas cryptic crossword. At other times of year, the cryptic crossword tends to be a solitary pursuit: stereotypically, the pin-striped businessman tackling the Telegraph on his morning commute or the university don dashing off the Times in a 20-minute coffee break. The Christmas puzzle, though, is a different affair. Usually larger, and often with a theme, Christmas cryptics demand more time, possibly a few sessions over the holiday, and those who create them know that any member of the family may be called on to work on individual clues. But what is a cryptic crossword? Each clue is a small word puzzle in itself. Solvers are given the number of letters in the answer and a phrase which is, on a first reading, meaningless or absurd. Cracking it involves spotting which part of the phrase gives a straightforward definition of the answer. The rest gives you another chance to grasp the solution, in the form of wordplay - an anagram, perhaps, or a string of abbreviations which combine to give the word or words to write in the grid - see examples, right. But if you haven't lived in the UK, that wordplay may prove a little challenging. "Pub", for example, is often an indication that the word contains an "PH", as in public house - and the same goes for "local", "boozer", or any other word used in the UK to describe an ale-house. That PH abbreviation is familiar to anyone who has used an Ordnance Survey map. And OS for Ordance Survey may also appear - a reference to "map-makers" in the clue could be the hint. That goes whether you live in the Home Counties ("SE", for the south-east of England) or the area crossword compilers like to describe as Ulster ("NI", for Northern Ireland). Then there are the sporting abbreviations. If your family is going to complete the grid, you'd hope to have one member who can pick out a piece of cricket terminology - "caught", say (C), or "not out" (NO) - and another with a grasp of the UK armed forces ("Jolly", slang for a Royal Marine may indicate RM. But it could equally be gardening, knitting or political parties. You might be wondering how this can be fun. 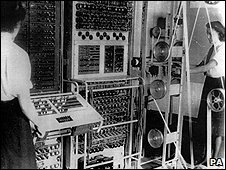 Christmas crosswords are not of the same kind as those used to help recruit code-breakers during World War II. For a start, many clues dispense with the definition/wordplay format and go for a pun. 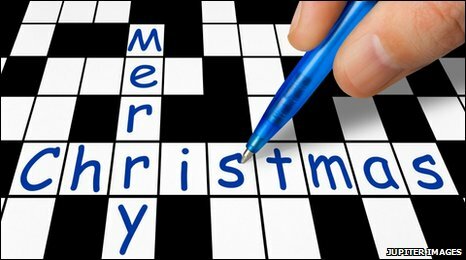 "Some of the best Christmas crossword clues are like Christmas cracker riddles," says Phil McNeill, the Telegraph's crossword editor, "except hopefully not quite as corny." He gives as an example "Something afoot in pantomime (5,7)"; the answer is "glass slipper" - a reference to the footwear in Cinderella, a seasonal staple in theatres. For another thing, solvers are helped by knowing that there may well be lots of Christmas-themed clues. Or a more elaborate puzzle might have a line from a well-known carol around its outer edge, giving an aid to completion, once this has been understood. So even if no-one manages to read that Dickens novel as planned over the break, they may still get the gist of it in crossword form. That is one big anagram. Answers to all clues mentioned are given below the picture. And if you now have a yen for this slow-burning pleasure with frequent bursts of seasonal inspiration, links to the main UK broadsheets are given on the right. It's not the same when it's not newsprint, though. Paul says of this clue by Araucaria: "This is all the more remarkable when you consider the next lines of the carol go 'The angel of The Lord came down and glory shone around'." 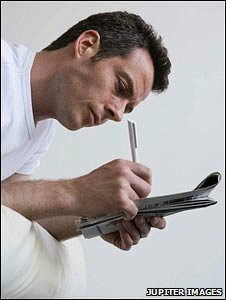 Made Up Phenomenon: Does sudoku make you fat?